Tosowoong is one of those brands that I want to love, but their products are so "hit or miss" for me that I have a hard time splurging on new products from them. 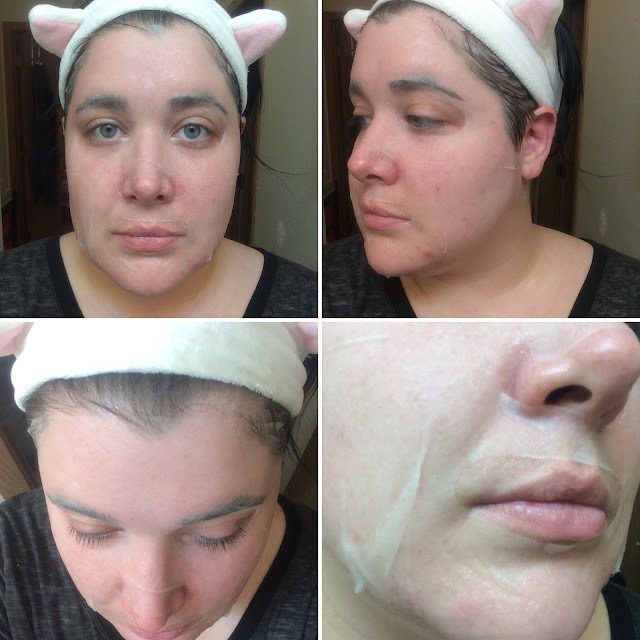 I had reviewed their Pure line of masks last year because I fell in love with the packaging - but was sorely disappointed by strong scents and minimal hydration. But on the flip side, their Enzyme Powder Cleanser is my favorite face wash right now. I have a few bigger items from Tosowoong on my wishlist right now, but I felt safer splurging on a few newer masks from them instead. 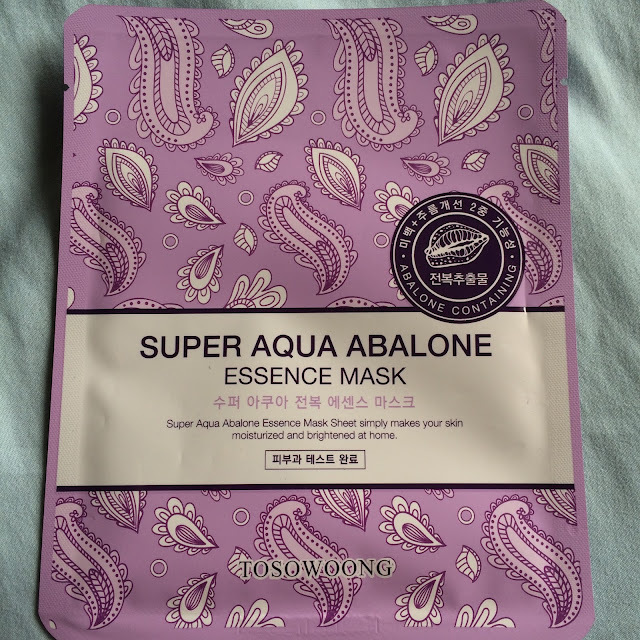 The Tosowoong Super Aqua Abalone Essence Mask comes is a very pretty purple paisley print packet, (say that three times fast...). The highlight of this mask is abalone, a marine snail, which is supposed to balance moisture in the skin and absorb/control excess sebum (which would be part of balancing moisture if you ask me). This mask not only claims to unclog pores but also to make the skin softer, smoother, and firmer. 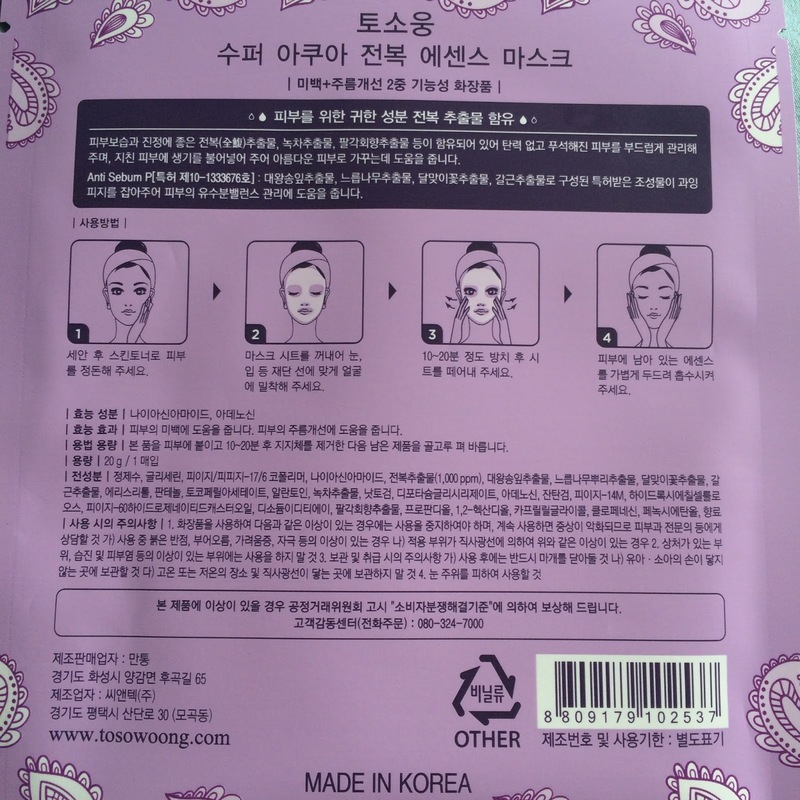 Ingredients: Water, Glycerin, PEG/PPG-17/6 Copolymer, Niacinamide, Abalone extract (1,000 ppm), Pinus Palustris Leaf Extract, Ulmus Davidiana Root Extract, Oenothera Biennis (Evening Primrose) Flower Extract, Pueraria Lobata Root Extract, Erythritol, Panthenol, Tocopheryl Acetate, Allantoin, Camellia Sinensis Leaf Extract, Natto Gum, Dipotassium Glycyrrhizate, Adenosine, Xanthan Gum, PEG-14M, Hydroxyethylcellulose, PEG-60 Hydrogenated Castor Oil, Disodium EDTA, Illicium Verum (Anise) Fruit Extract, propanediol, 1,2-Hexanediol, Caprylyl Glycol, Chlorphenesin, Phenoxyethanol, Fragrance. Do not use this mask if you are sensitive to any of it's ingredients. The mask itself is made from a bio-cellulose material that is thin and soft but holds a great amount of essence. The essence is thick like a serum, with little scent that does disappear once the mask is applied. I would describe it as a fresh scent, and definitely unoffensive in my opinion. 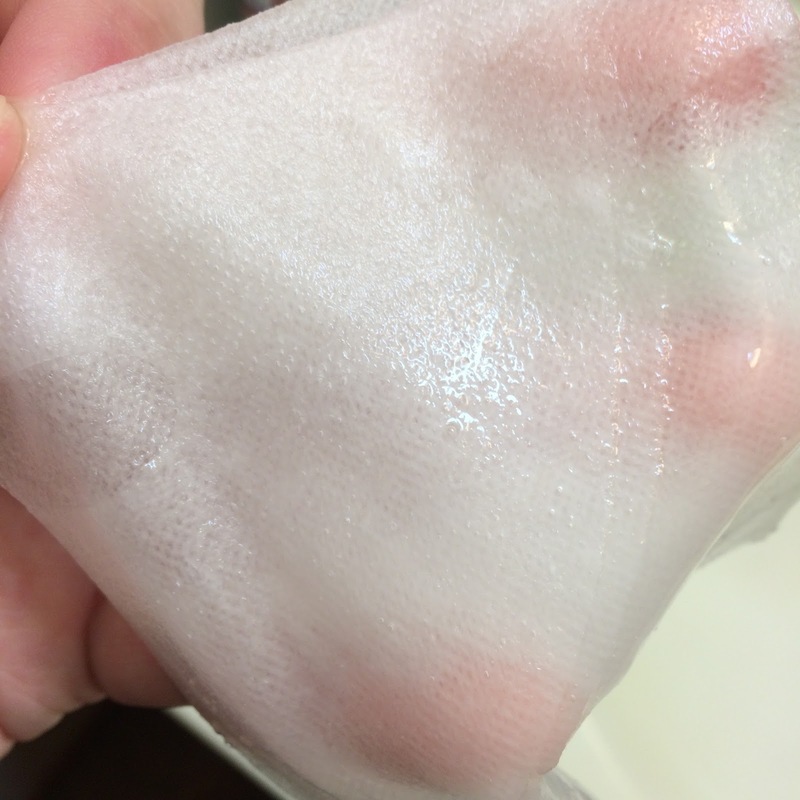 When applied, I felt a tingly cooling sensation on my skin, which surprised me, because nothing from the description indicated that I would encounter such a feeling. It wasn't unpleasant, and was actually quite relaxing at the time, but I did make a mental note to watch for any irritation that this would be an indicator of. I left this mask on for about 40 minutes before it felt too dry in most areas to leave on my face any longer. 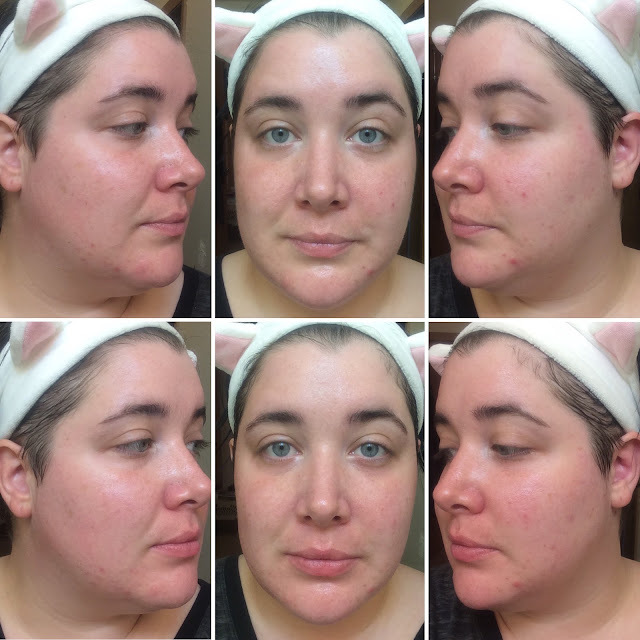 Despite the relaxing feeling of the cooling sensation the mask left on my face, I could clearly see some irritation on my skin after removal. My skin was more pink in areas, and although not swollen or in pain, I had two small pimples show up overnight. 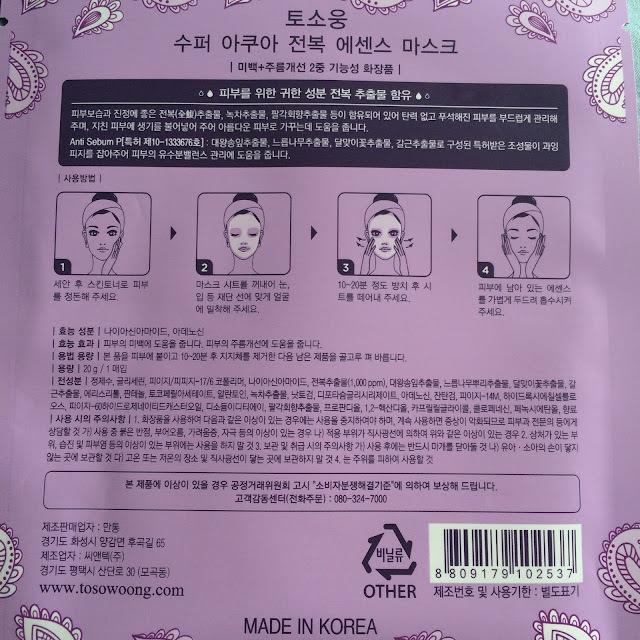 I purchased this mask from Memebox USA. TL;DR: This mask has some big claims making it seem perfect for my skin; balances moisture, controls sebum, firms and hydrates. This mask fit great, had little scent, and gave a cooling sensation while on the skin. Unfortunately it seems to have irritated my skin by causing redness and two small pimples.